Powerful Entertainer. 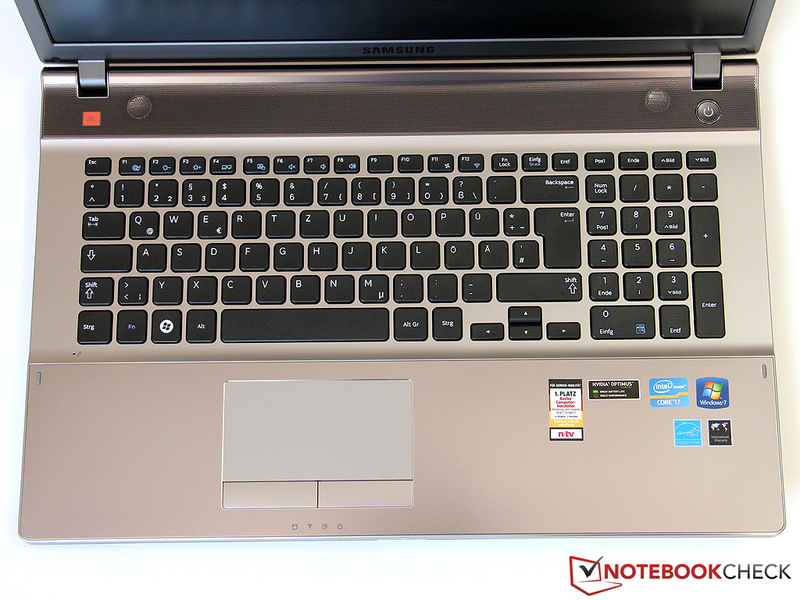 Attention multimedia fans: Samsung has produced an elegant 17-inch notebook equipped with serious brand new hardware from Intel and Nvidia. Read our extensive review to find out what it is capable of. "The Search is Over". At least according to Samsung, that is. They use this slogan to promote their mid-range Series 5 line of laptops. 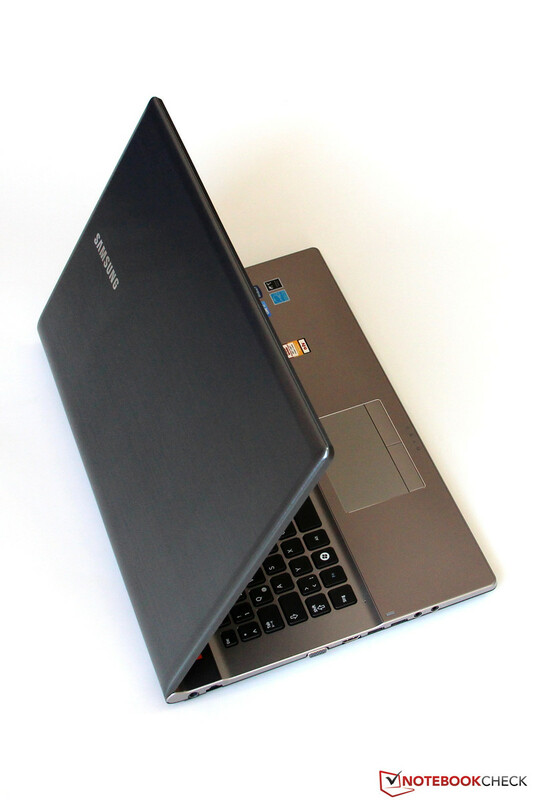 Samsung has tried to aim the 550P7C at the consumers looking for a balanced laptop for home entertainment. To achieve this, they have equipped it with an anti-glare 17-inch display, a 2.1 sound system by JBL, and a lot of powerful hardware: The combination of Intel's Core i7-3610QM and Nvidia's GeForce GT 650M should easily satisfy the demands of most users. The version with 8 GB RAM and a 750 GB hard disk drive retails for about EUR 950(~$1200). A more expensive version featuring a massive 2TB of storage and a BluRay drive is available for a premium of EUR 300(~$380). 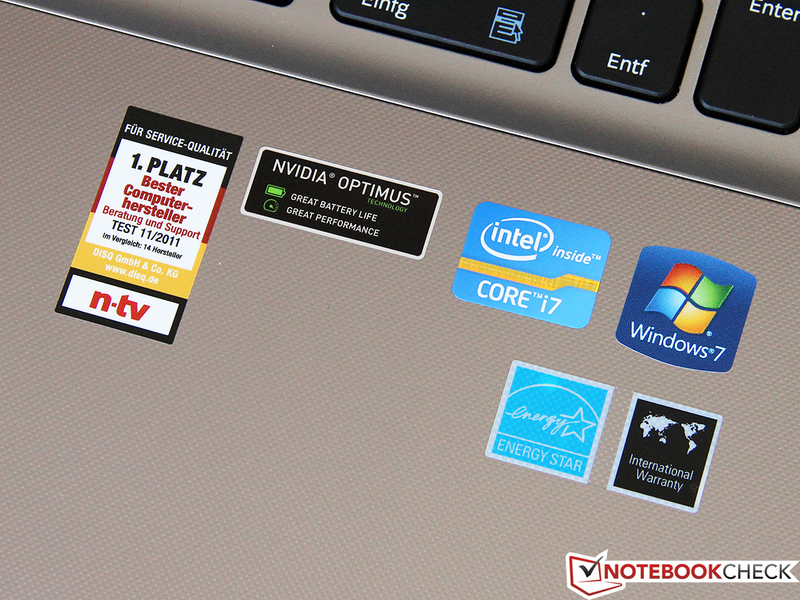 We have already tested two other laptops- the Acer Aspire V3 and the One M73- which have comparable specifications and fall in the same price range as the Samsung. 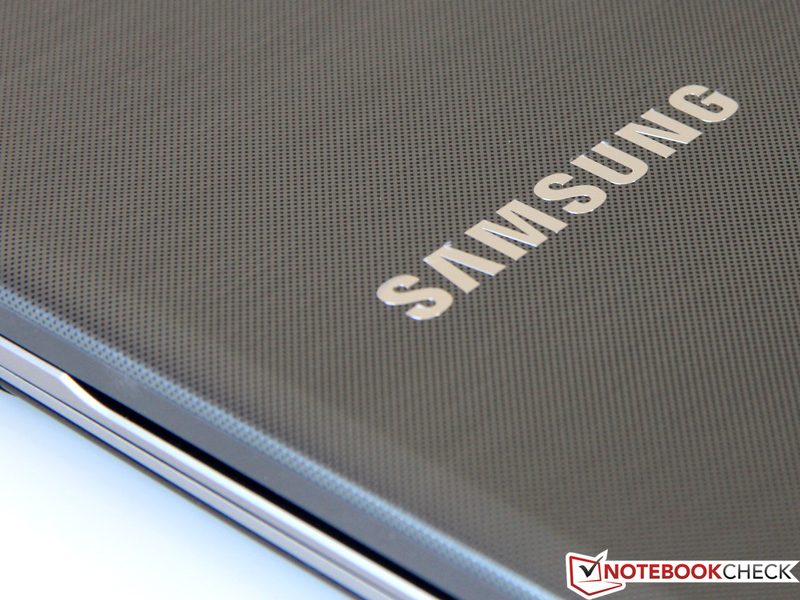 The Samsung will be tested for its competitiveness to the laptops from Acer and One. From the start, it is obvious that the 550P7C is aimed at a different type of customer compared to the similarly configured Alienware M14x. Instead of featuring striking colors and a flashy look, the Samsung design is more subtle, using shades of silver on a plastic body. Thanks to the excellent fit and finish, it doesn't look cheap. With a height of 32mm and a compact footprint of 40.8cm x 26.0cm, it is one of the smallest 17.3” desktop replacements on the market. This is achieved by having a thin bezel measuring a mere 10mm on the sides of the display. 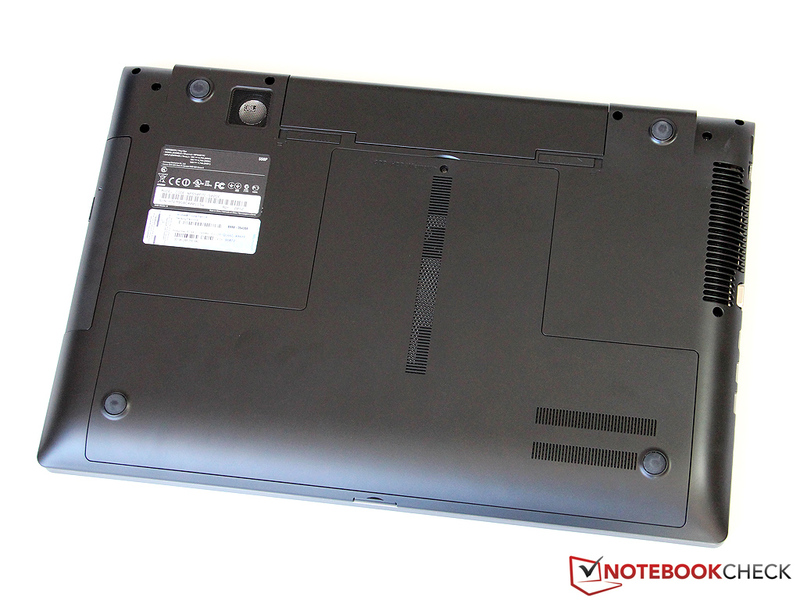 The relatively low weight of 3kg (~6.6lb) makes this one of the more portable notebooks in this form factor. The biggest disadvantage that you can come across in such designs using plastics is the case stability. Manufacturers are unable to come up with a rigid chassis when trying to meet such build dimensions. The case can cope reasonably well with point pressure, but its resistance to torsion is very disappointing. Both the display lid and the base warp with minimum effort. Therefore this model ought to be treated with considerable care. The same applies to the tight but not very strong display hinges, which cause the display to wobble after impact. Overall the 550P7C gets average marks for its build quality. There is still ample room for improvement. Using light Aluminum based alloys can mitigate certain issues concerning stability of the chassis, very similar to what HP managed to achieve with the Pavilion dv7. Port selection is decent. 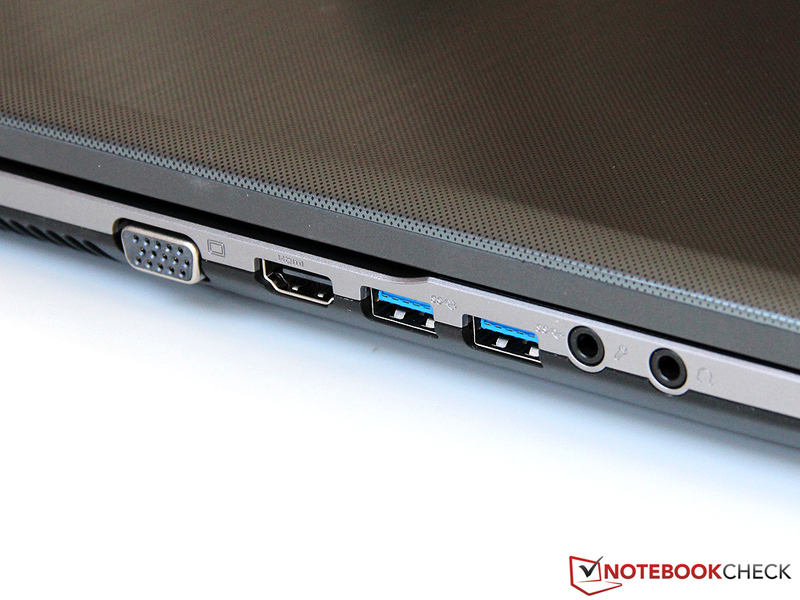 The laptop comes with 2 x USB 2.0 and 2 x USB 3.0 ports. It features the standard display connectors like VGA and HDMI but misses the DisplayPort. This is in line with what we have come to expect from consumer grade laptops in this price range. Gigabit LAN, a 4-in-1 card reader (SD/SDHC/SDXC/MMC), a couple of audio jacks and a Kensington lock slot complete the selection. 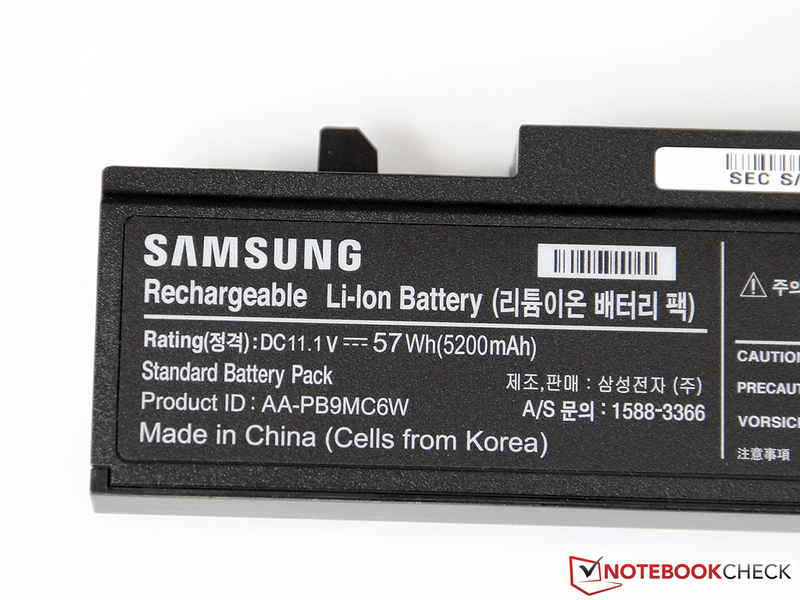 The location of connectors follows the pattern as on other Samsung models such as the recently tested 305E7A. Unfortunately, this means that the concentration of ports is greater on the left side of the unit, leading to a lot of clutter. A particularly fat USB stick easily blocks both USB 3.0 ports, and left-handed users are hindered by cables connected to the VGA or HDMI ports. 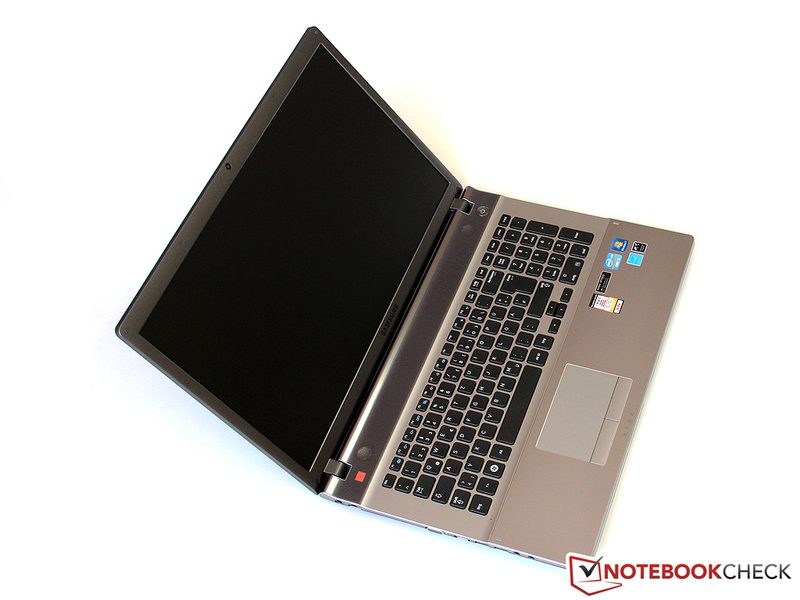 This affects most other notebooks including the Acer Aspire V3 and the HP Pavilion dv7. Samsung has given special attention to the selection of high quality hardware which has meant that components like the WLAN module have received some much needed attention which has proved to be very important in today’s connected world. Intel's Centrino Advanced-N 6235 features MIMO support (2x2) which enables it to achieve high transfer rates up to 300 Mbit/s (upstream and downstream). It is configured for the IEEE 802.11a/b/g/n specification and therefore also covers the 5GHz band. In contrast to the previous model 6230, Bluetooth version 4.0 is now supported. The laptop doesn’t come with UMTS/HSPA and LTE support. A 1.3 megapixel webcam allows for video chats and photographs which are quite decent when taken in sufficient ambient light. The muffled sound of the microphone is a problem, especially when voice is being recorded, rendering it unintelligible. A headset is advisable in this case. 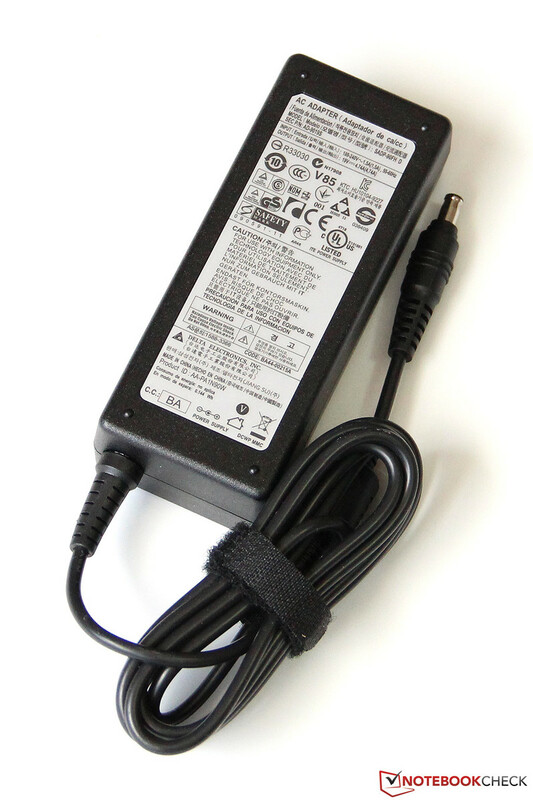 As usual, the list of accessories supplied is very short: A small bundle of leaflets is all the user gets, apart from the battery and the 90 watt PSU. At least there is a recovery DVD, which many other suppliers don’t provide. We weren't too happy with the bundled operating system, Windows 7 Home Premium (64 Bit). No customer would really use the numerous toolbars, test versions of commercial software, etc. It would have been better if such software had been provided on a CD rather than coming pre-installed. 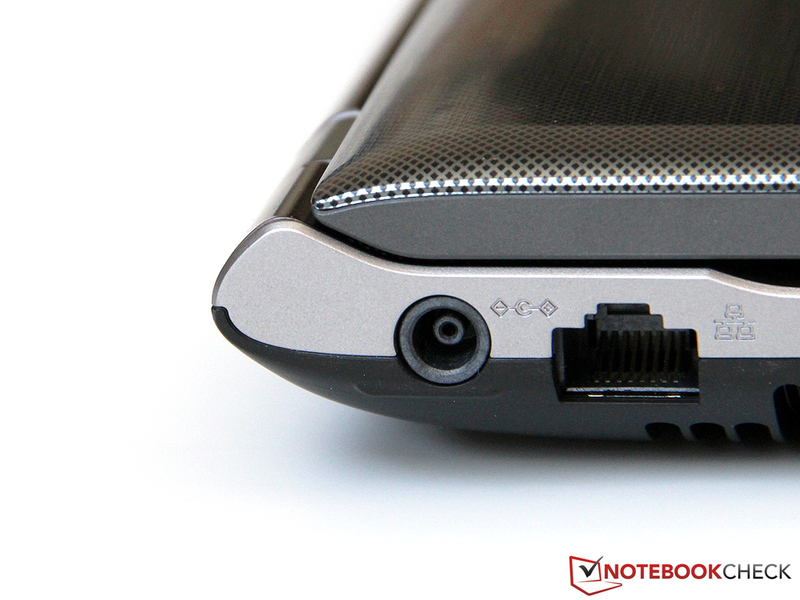 A single screw holds the service flap on the underside of the case, which should make it easy to open the notebook. So we thought. But Samsung has used a lot of little plastic hooks to hold the lid in place, which makes removing the lid a bit of a challenge. Only with a lot of force (which produced unsettling noises) were we eventually able to remove the lid. Opening it the second time was easier, but whether this construction will survive many such attempts is highly doubtful. Once the lid is removed, the two memory slots (both occupied) and the hard drive are accessible. A second 2.5 inch drive can easily installed as all the necessary screws and cables are already provided, a move we want to commend Samsung for. Cleaning the fan is more difficult though, as this requires further disassembly of the notebook. Users who find the standard on-site warranty of 2 years too short can purchase additional service packages from online retailers. Prices for these seem fair when compared to other manufacturers, approximately EUR 100 (~$120) for a warranty extension to 4 years. 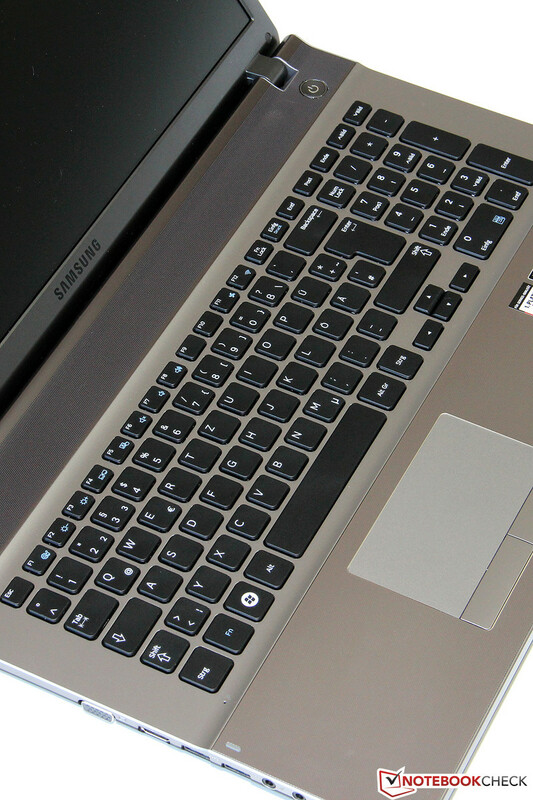 We have had good experiences with Samsung's input devices in the past, and the 550P7C continues this tradition. The matte black keys in a chiclet design measure approximately 15mm x 15mm which is typical for notebooks. There is a separate numeric keypad which is usually found in this form factor. Samsung has stuck to the current convention of slightly recessing the keyboard. Apart from the rather small cursor keys, we couldn’t find any other peculiarities. The typing experience is excellent. This is mainly due to the clearly defined and firm key actuation point, providing the user with precise feedback for every keystroke. Some might prefer a bit more travel, but that's a matter of taste. A minor niggle is the slight ratting noise that occurs when typing at speed, and this could probably have been reduced further. 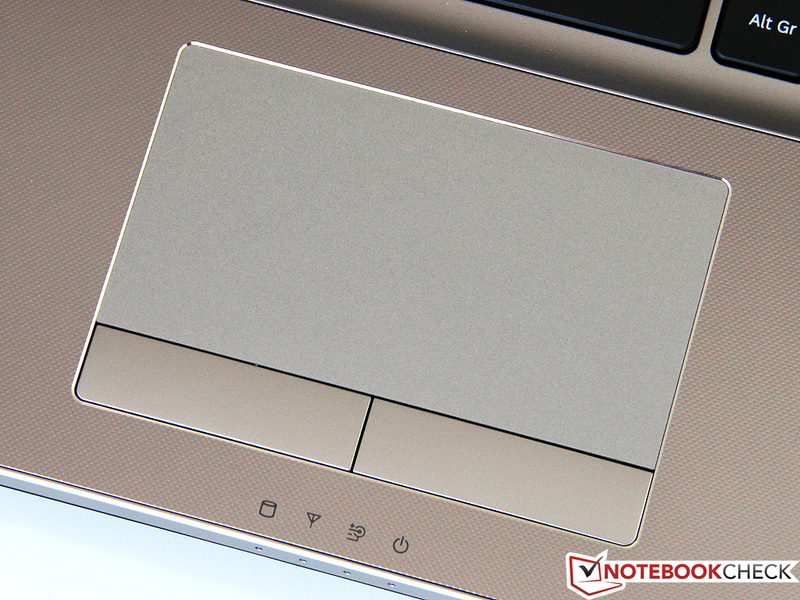 The touchpad by Synaptics is framed by a thin silver colored strip and has rather generous dimensions of 103mm x 55mm. 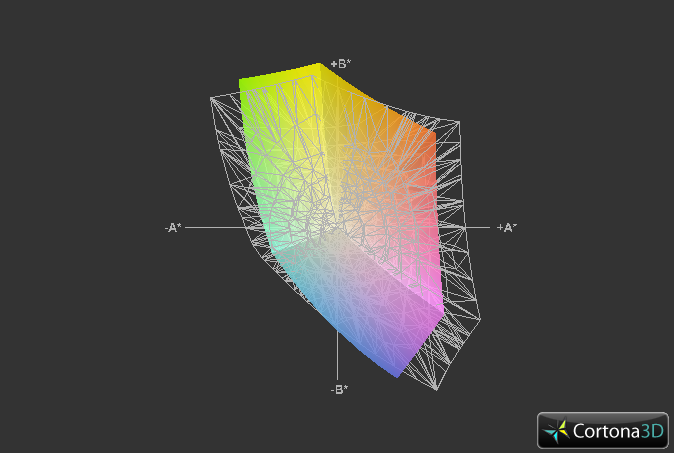 While the feedback to touch is pleasing, the surface isn’t textured. Sweaty fingers glide across it effortlessly, and a high level of precision is maintained right up to the edges. 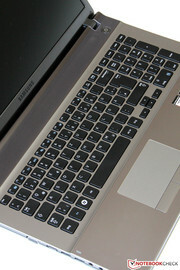 The common multi-touch gestures such as pinch-to-zoom and two-finger scrolling are recognized. There is also the option to activate a scroll area on the touchpad's right and/or bottom margins. Both mouse buttons below the touchpad work flawlessly and emit a crisp but not too loud click. When using an external mouse the touchpad can be deactivated by pressing the Fn + F5 keys. 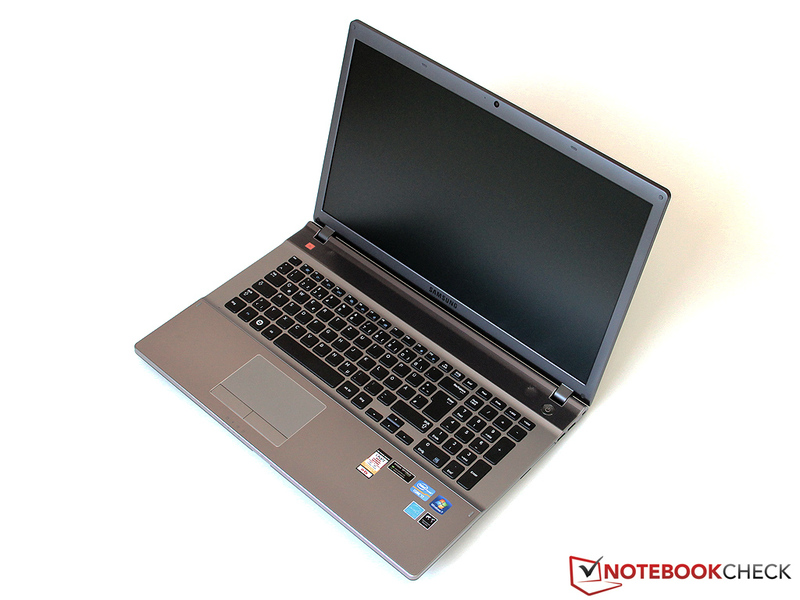 Being a 17.3” multimedia notebook, the 550P7C is fitted with an average WXGA++ display (a resolution of 1600 x 900 pixels). 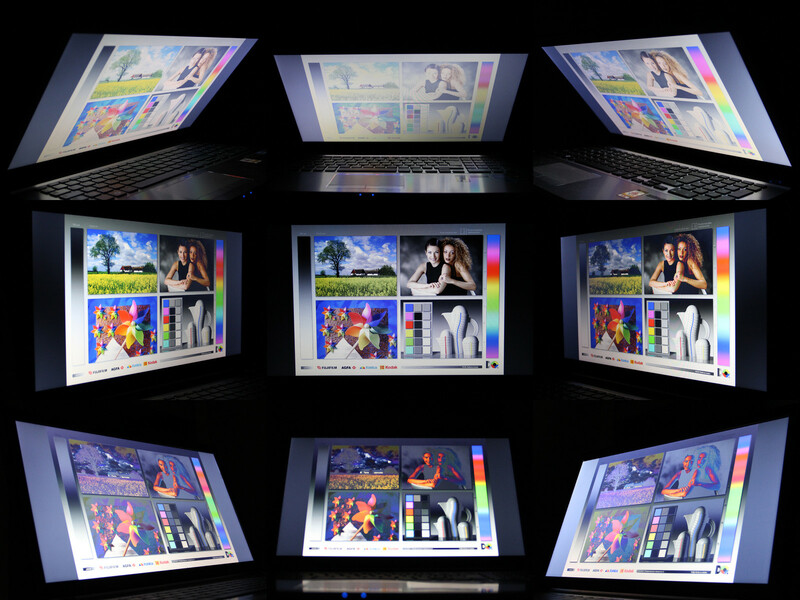 Samsung is resisting the trend towards glossy displays and uses an anti-glare panel. Thanks to its 106 dpi pixel density, the laptop screen is comfortable for viewing text without needing to adjust the font size. For multitasking or certain graphics applications, a higher resolution would be desirable. 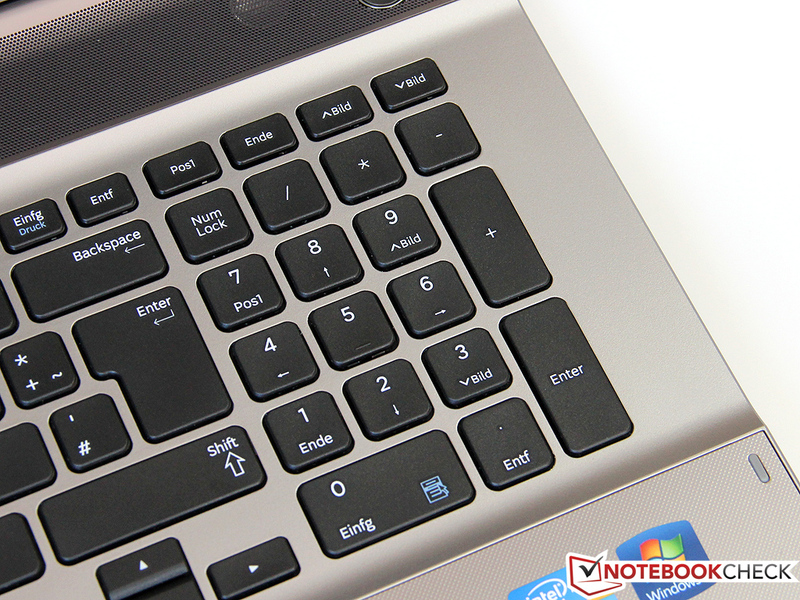 The screen is LED back-lit and achieves a maximum brightness of 221 cd/m2 that matches its rival, the HP Pavilion dv7. This is sufficient for working indoors. Despite the measured values not being perfect, there is no cause for complaint as the screen is lit evenly and shows no spots or backlight bleeding. Due to the very high black level of 1.96 cd/m2 the resulting contrast ratio is a poor 121:1, and this panel cannot compete with premium full-HD displays such as the one used in the One M73 (955:1). This becomes particularly apparent while gaming or watching HD movies, where images look much less vibrant on the TN panel (LTN173KT028), which is another one of Samsung’s own products. The color range is average, covering only 80 percent of the sRGB spectrum. While this is an important criterion for photographers and other graphics professionals, it shouldn't be a limitation for other notebook users. 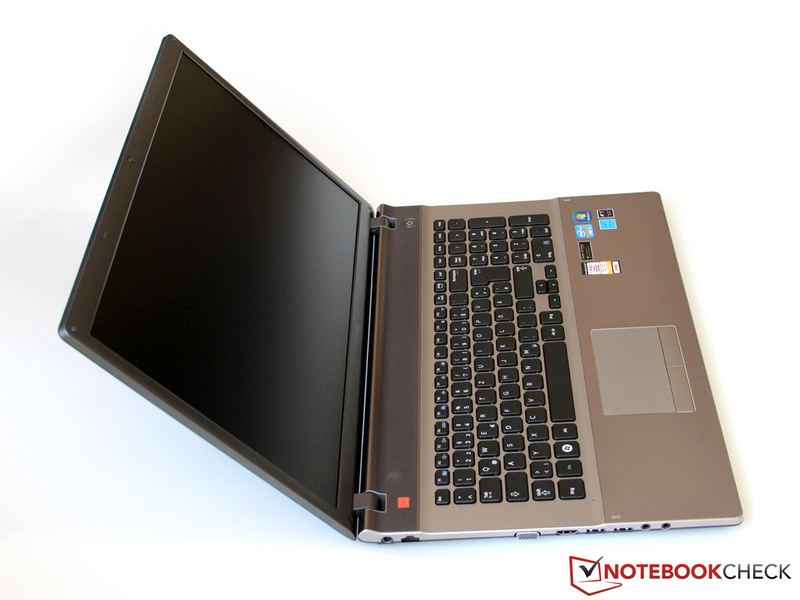 Models by other manufacturers such as Acer and HP have similar characteristics. Users who wish to use the Samsung 550P7C outdoors will be well-served by the display's anti-glare finish which reduces annoying reflections to a minimum. If the sun is too bright, the insufficient screen brightness would make it difficult to use the laptop in such conditions. Luminance should be at least 250-300 cd/m2 for outdoor use, a target met easily by the One M73. Viewing angles are another weak point of the display, not faring any better than other notebooks with similar low grade TN panels. Vertical Viewing angles are the most severely affected with even slight screen tilting leading to image distortions. 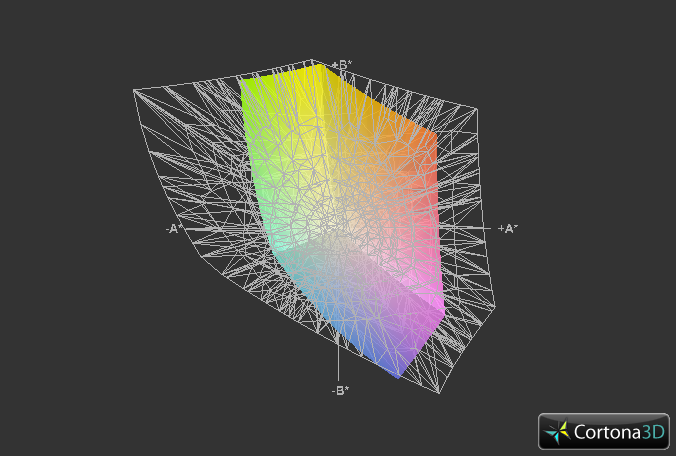 Horizontal viewing angles are much better. The image quality is decent at wide angles which should mean that viewing the screen with friends crowded in front of the laptop is possible. Consumers wanting to use an external display should consider using the HDMI interface whenever possible. The VGA output on our unit had a strong yellow tinge. Picture sharpness and flickering were satisfactory though. Offering excellent value for money, the Intel Core i7-3610QM has quickly become one of the most popular CPUs from Intel’s new line of Ivy Bridge processors. That is not surprising, as 4 processor cores at a frequency of 2.3 GHz (turbo stepping for 4/2/1 cores: 3.1/3.2/3.3 GHz) provide outstanding performance, equivalent to the previous king of the hill, the i7-2920MX. The new 22nm fabrication process allows the TDP to stay at 45 Watts. With techniques such as hyper-threading, allowing the parallel processing of up to 8 threads, AES-NI and AVX, this CPU should be able to support future applications. Current tasks rarely utilize its full potential. Graphics processing under low load is performed by the HD Graphics 4000 IGP, which is equivalent to the entry level graphic solutions from Nvidia and AMD. For games and other 3D applications, the Nvidia GeForce GT 650M provides additional processing power which uses Optimus technology for automatic switching. A generous 750 GB of hard disk space and 8 GB of RAM (2 x Samsung 4GB DDR3-1600 modules) should satisfy the needs of most users. An SSD is not included. Even though the Core i7-3610QM is only an entry-level model in Intel's current quad-core line-up, its performance is impressive. Running Cinebench R11.5, the processor turns in a score of 6.18 which is easily twice the performance of the popular mid-range CPU, the i5-2450M. 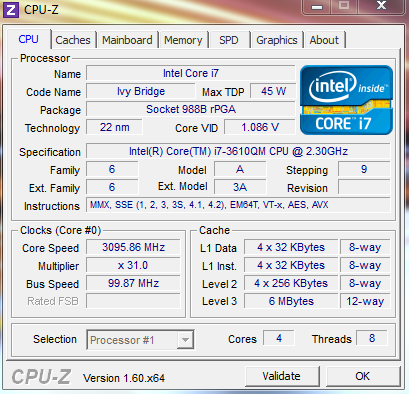 Even the fast Core i7-2670QM is a good 15% slower. When it comes to single-thread benchmarks like Cinebench R10 (64 Bit), the performance numbers fall in the same range, but the 3610QM still gets a places at the higher end of the spectrum with a score of 5640. 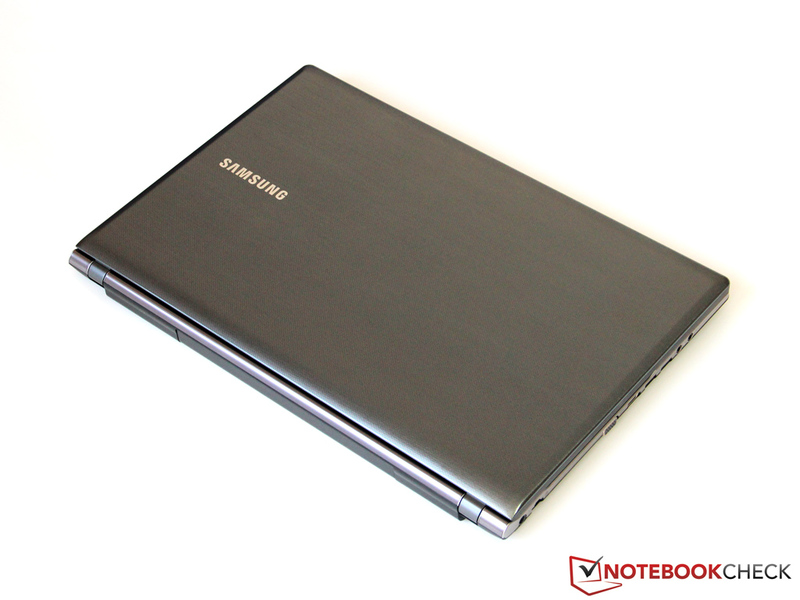 Running the laptop on the battery, Samsung drastically reduces the performance by switching off Turbo Boost. 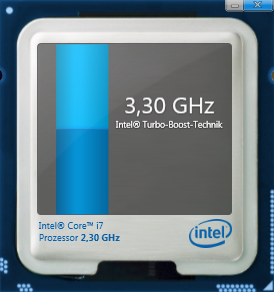 Instead of the 3.3 GHz available for faster processing, you are limited to 2.3GHz. This means that depending on the application, up to 40 percent of performance is lost. This should rarely affect the user as the 3610QM still breezes through applications in such conditions very easily. A retail price of about EUR1000 (~$1250) and no SSD! 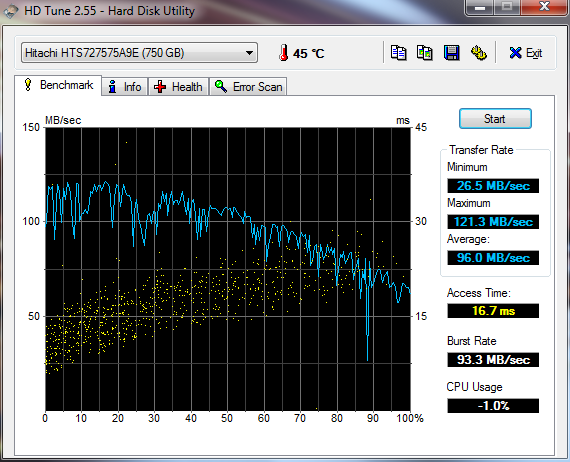 This isn’t much of a drawback as the included Hitachi hard drive (Travelstar 7K750) is a 7,200 rpm one with 16 MB cache. This makes it one of the fastest of its kind, as our benchmarks convincingly prove. At its peak we measured a good sequential transfer rate of 121.3 MB/s, and the average value of 96 MB/s is good. And a seek time of 16.7 milliseconds isn’t really fast compared to an SSD which is about 0.1 milliseconds or less. 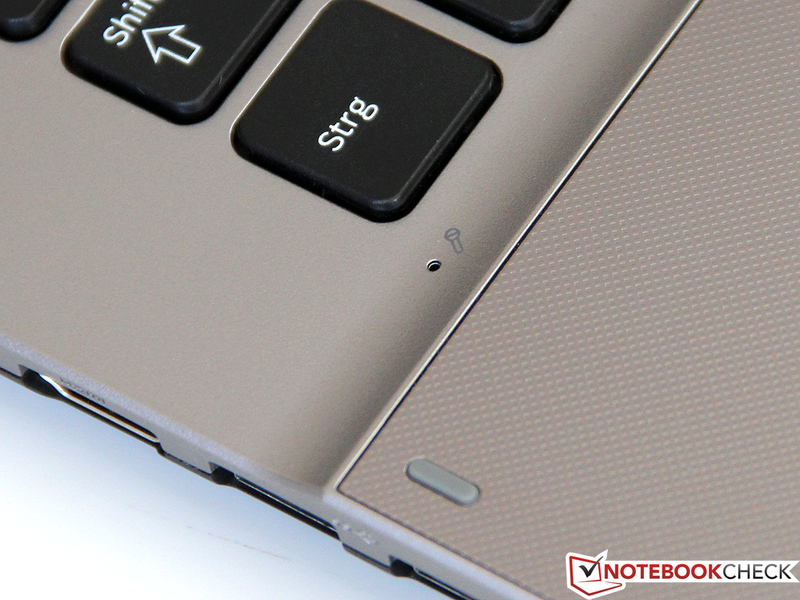 The notebook is not able to post scores comparable to other laptops in the storage intensive PCMark tests due to the lack of an SSD drive. The laptop posted a score of 2750 in PCMark 6 and 9304 in the older Vantage version which isn’t bad. In general usage, there is hardly any commonly used application that would cause this laptop any trouble, whether it's elaborate photo or video editing, excessive multi-tasking, or other demanding tasks. Only when working with large amounts of data, an SSD might be desirable to reduce loading times. Therefore, this is an aftermarket upgrade that we would consider. There are some 128 GB SSDs available for under EUR100 (~$125) right now, which is a highly recommended investment we feel would be worthwhile. Nvidia's Fermi architecture was good in its time, but the new Kepler is even better. The GeForce GT 650M is a member of the mid-range of graphics cards, based on the GK107. TSMC's 28nm process is being used here for the first time, allowing for more complex chips with higher performance per watt. 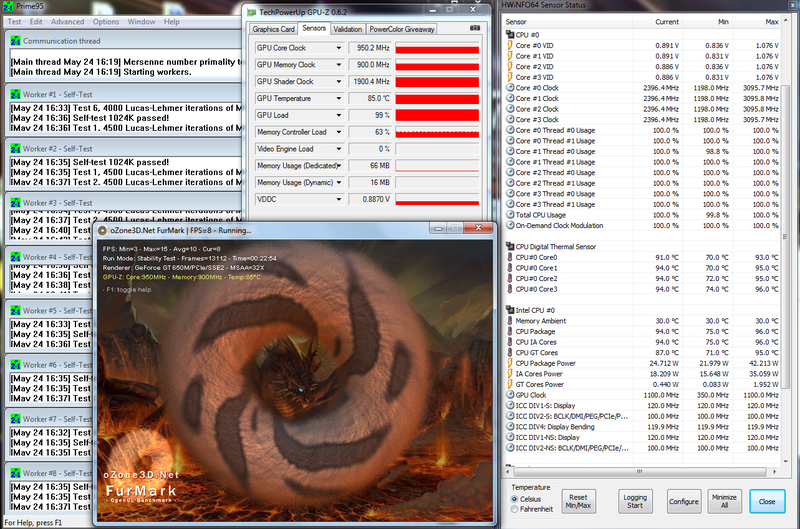 Having abolished hot-clocks, the 384 shader ALUs of the new 650M equate to about 192 units of the older GTX 460M/560M, and these cards achieve a similar level depending on the benchmark used. 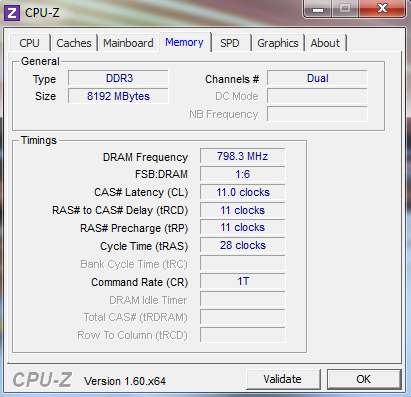 Working with an impressive 2GB of VRAM, accessed through a 128Bit interface, the 835 MHz chip (up to 950 MHz in turbo mode) has its performance reduced marginally by the usage of slower DDR3 memory. Overall, the 550P7C achieves a good score of 2406 points in the 3DMark 2011 benchmark, a result similar to the One M73 and the Acer Aspire V3. The Radeon HD 7690M XT, installed in the last generation HP Pavilion dv7, is no slouch, but has to concede defeat scoring a mere 1,500 - 1,600 points, despite using GDDR5 VRAM. The 550P7C is a decent gaming platform. 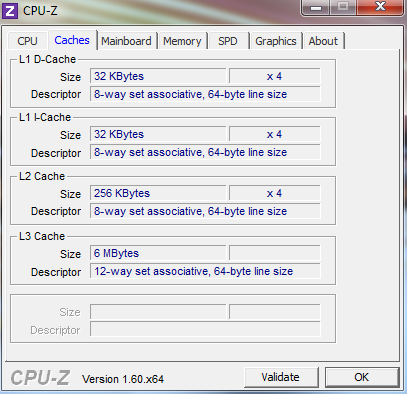 Its strong performance in the synthetic tests is supported by a good showing in the gaming benchmarks. 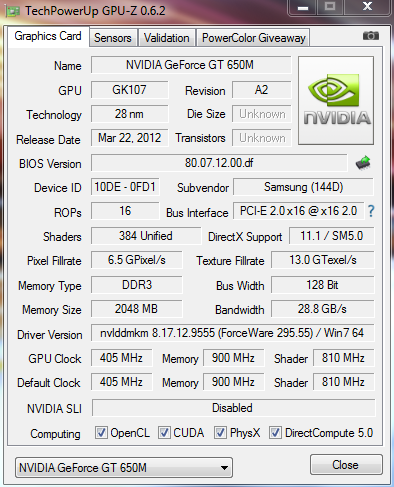 Fifa 12 is not a challenge for the GPU. In full-HD resolution on an external monitor, with maximum detail settings and 4x anti-aliasing, the frame-rate exceeds 100fps which allows for an unhindered gaming experience. The situation is similar with the brand new RPG, Diablo 3. Although one should stick to the native resolution to avoid the frame rate occasionally dropping below 30 fps in major battles. All other games play smoothly as well in 1600 x 900 resolution. Performance isn't always good enough for full A/AF settings, Anno 2070 and Dirt 3 being examples of this. To get even better graphics performance, a high-end card such as the GeForce GTX 670M would be necessary, but that is in a different price range. Compared to previous mid-range cards such as the GeForce GT 540M, speed increases of up to 100% have been observed, making the GT 650M ready for upcoming game titles as well. Fan too loud? 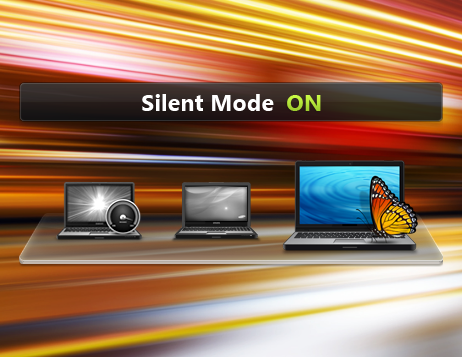 The Silent Mode provides relief. No more than a subtle murmur can be heard in idle mode, and at a level of 31.4dB (A) it is likely to be ignored in most environments. The fan is rotating permanently even in the 'silent mode,' but it spins at a slow speed. 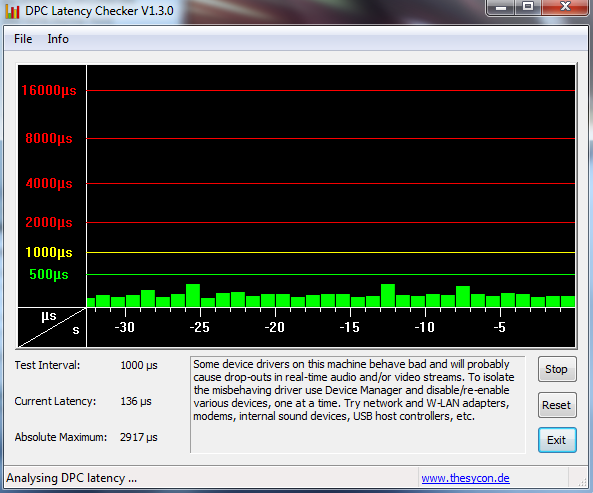 The HDD is silent for a 7200rpm drive. Only when accessing fragmented data, a minute hum is emitted from the case. During light office tasks, the sensitive cooling system cranks up a little and emits noise at 32.3dB (A), which is still very quiet. Under full load, the level increases to 36.8-39.2dB (A), the higher value only occurring during our stress test with the fan set to 'turbo' mode. Alternatively, the user can switch to Samsung's 'silent mode,' which limits the noise level to 33.4dB (A). This comes with a slight loss in performance. 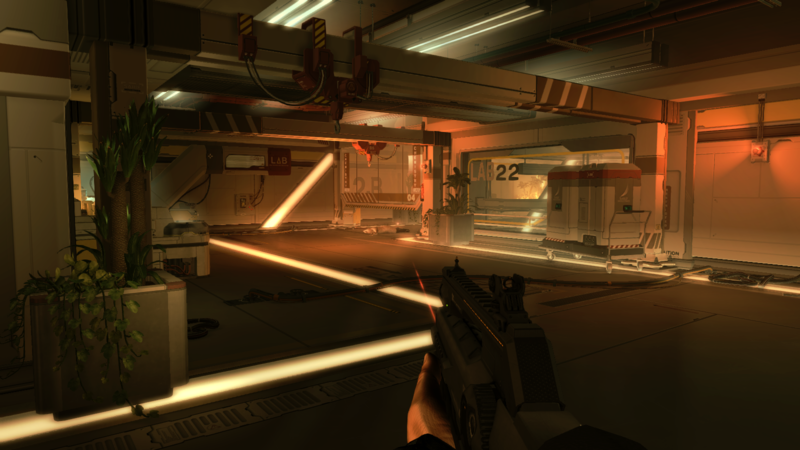 The 3DMark 11 test showed a performance drop of about 10% compared to normal operation. 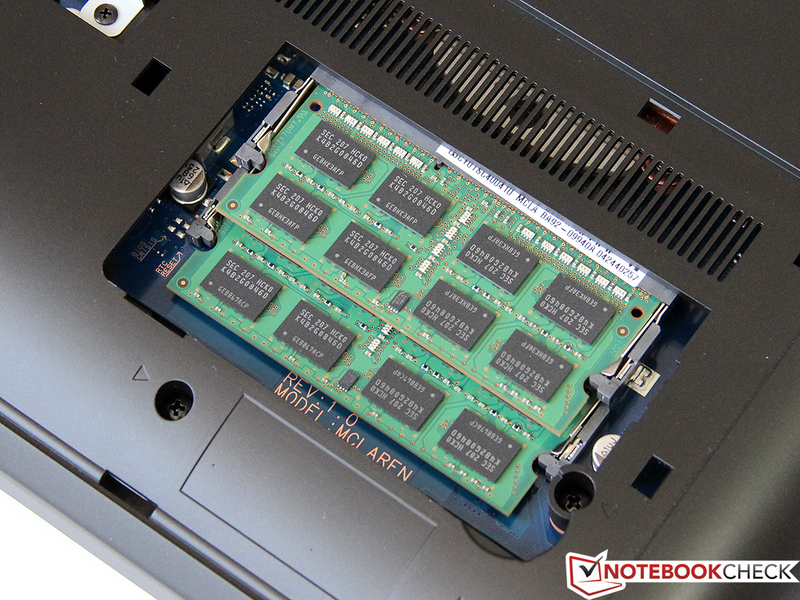 In addition to low noise emissions, developers need to achieve an acceptable temperature profile, which, considering the powerful hardware packed into this notebook, wouldn’t have been easy. Samsung has accomplished this. The relatively low case temperature of 26ºC and approximately 32ºC under full load are impressive numbers for a model in this range. But the base has a pronounced hotspot in the area around the air vent. Keeping clear of that, the notebook can be rested on the lap without discomfort. During our stress tests (Prime95 and FurMark) we noticed something peculiar happening with the CPU. 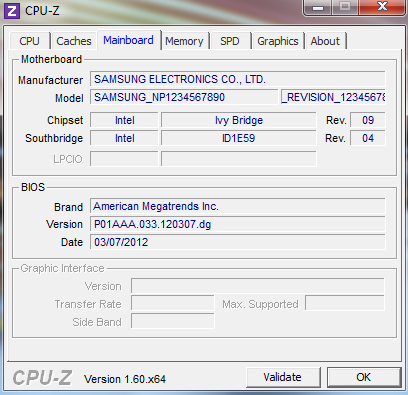 Throughout the duration of the test, the CPU frequency continued to fluctuate between 1.2GHz and 3.1GHz, sometimes leveling off in between. At this stage the temperature readings were not critical (an initial 70ºC to a toasty 95ºC), which leads us to suspect that the cause might be the 90W power supply unit being too weak. The GPU kept its maximum frequency of 950 MHz continuously and reached a maximum temperature of 90ºC. (+) The maximum temperature on the upper side is 39.4 °C / 103 F, compared to the average of 36.5 °C / 98 F, ranging from 21.1 to 71 °C for the class Multimedia. (-) The average temperature of the palmrest area of similar devices was 29.1 °C / 84.4 F (-5.3 °C / -9.5 F). 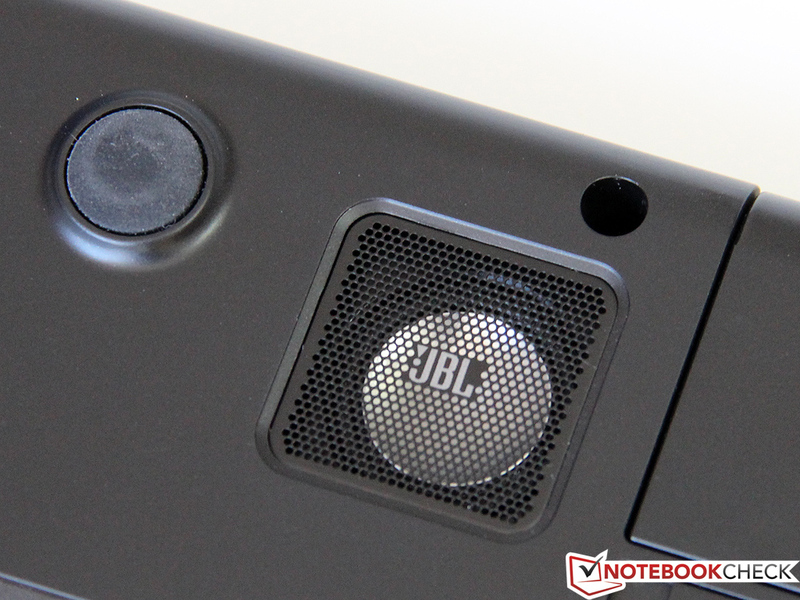 The JBL logo adorns the case of the Samsung 550P7C, and this raised our expectations for the sound quality. We were not disappointed. 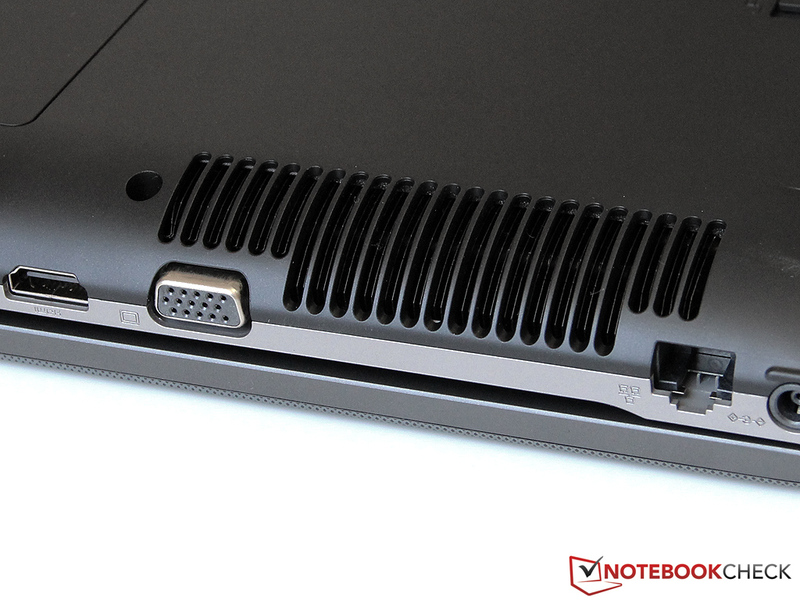 The speakers, including a small subwoofer under the laptop, are quite powerful, at least by notebook standards. At maximum volume, the laptop caused the desk to vibrate. There were no distortions in the sound from the speakers at these high volumes. A 3.5mm mini-jack socket and the digital HDMI port allow for external speakers to be connected, the latter requiring an AV amplifier of course. Nvidia's Optimus technology can take some of the credit for this model's power consumption in idle mode being a very modest 9.1-14.7W. 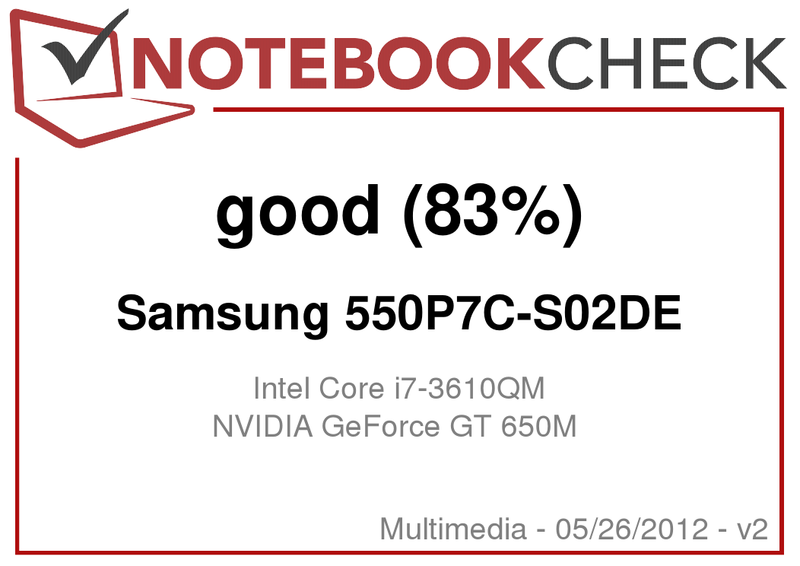 But this notebook also seems to have been optimized very well by Samsung, as rival models with similar specs have been markedly more power hungry. 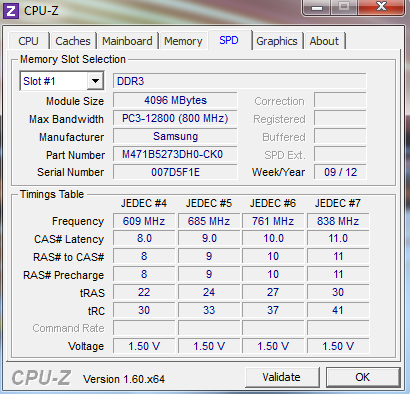 Using 3DMark 06 to simulate games and 3D applications, power consumption increases to an expected 78.8W. 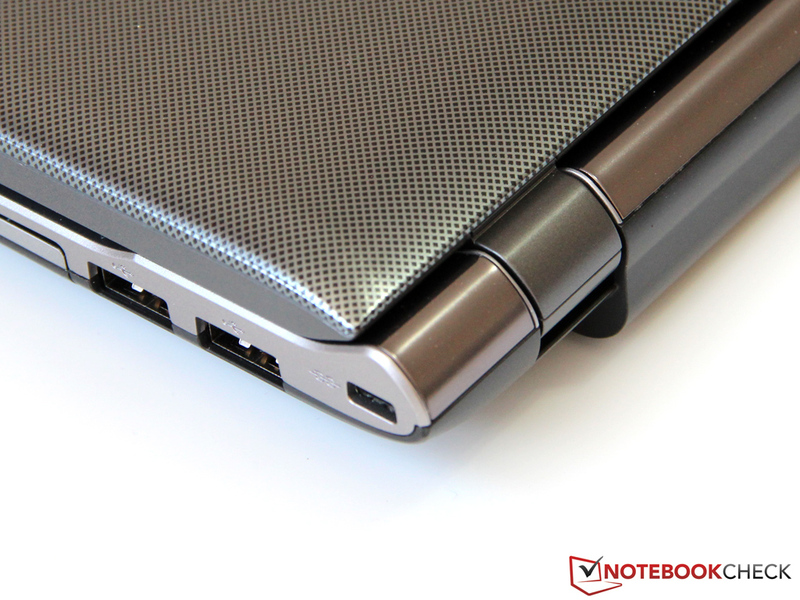 What is surprising is that the much slower and older HP Pavilion dv7 is hardly any more frugal at 71.2W. This indicates the strides taken by modern fabrication processes of the CPU and graphics card to give us better power utilization. The installed hardware should actually cross the 100 Watts threshold quite easily, but the aforementioned throttling kicks in before it comes to that. 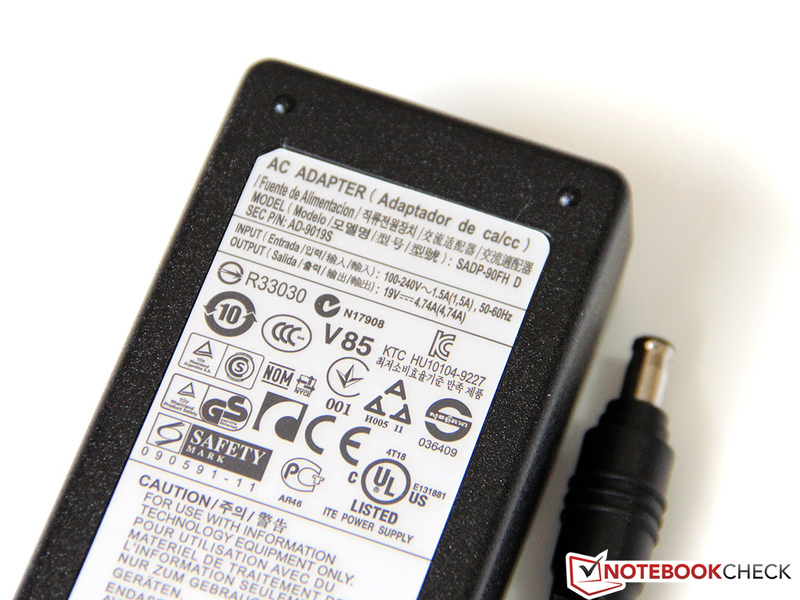 The PSU with its 90 Watts output cannot cope with the maximum load and the CPU frequency is consequently reduced. 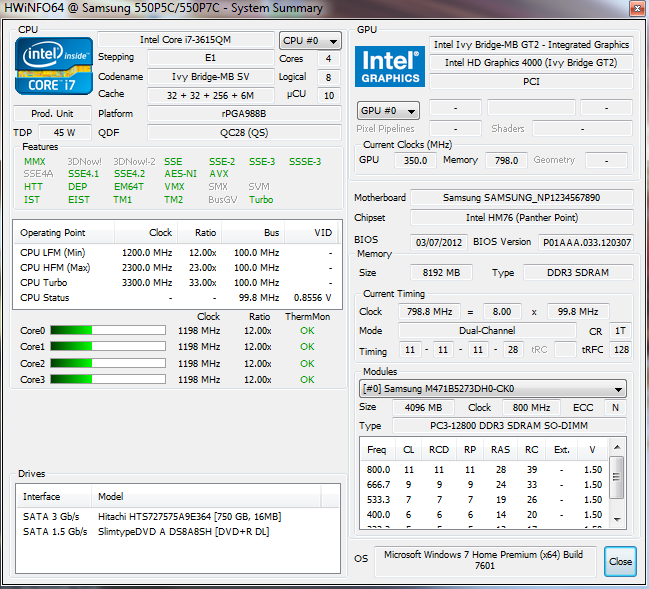 Ivy Bridge can do it after all. 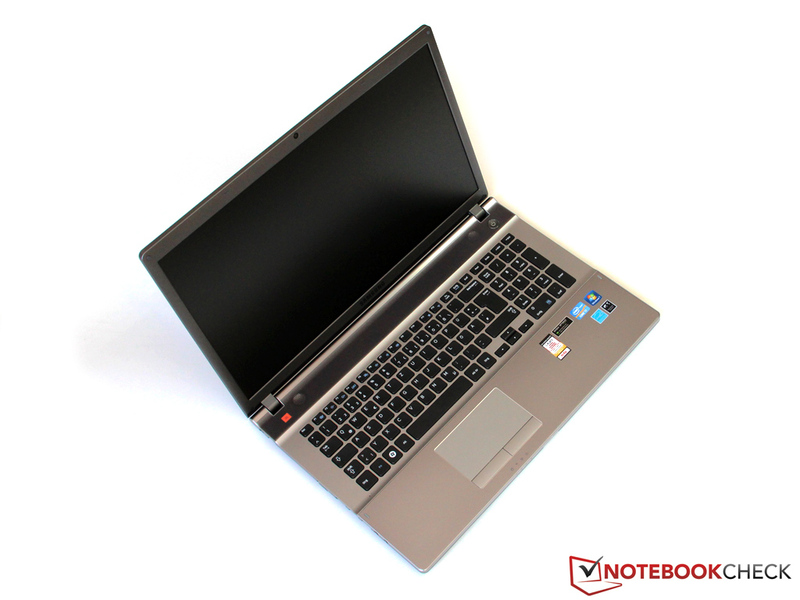 Lasting over 7 hours in idle mode, the 550P7C is the first notebook based on the new platform that can achieve such an extensive run time. For everyday use Battery Eater's 'Readers Test' will not represent the actual usage pattern with its maximum energy-saving settings. Running our standardized 'Surf Test' with WLAN switched on and a screen brightness of 143 cd/m2, the notebook lasted a respectable 4 hours 31 minutes. That is not enough for a full day's work, but it can be stretched a bit further with the occasional standby time. At full load using Battery Eater's 'Classic Test' (maximum performance, radio modules and Nvidia GPU switched on, maximum brightness), the notebook lasts just over an hour, despite having a 57 Wh battery. A full recharge of the battery takes a good two hours on the mains, after which the Samsung is ready to go again. Samsung has produced a balanced all-rounder with the 550P7C. 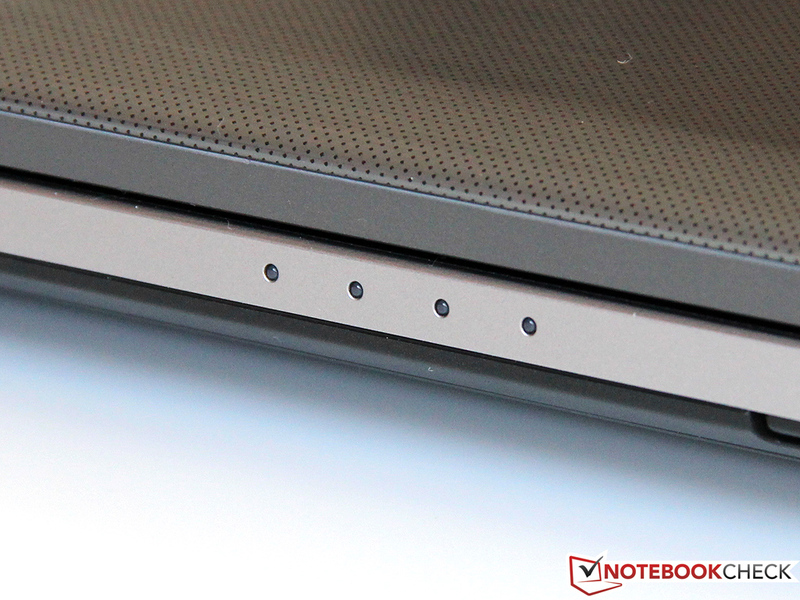 Even with few minor weaknesses, the laptop made a positive impression overall. Yes, the case of this 17-inch model could be more stable, but the understated design is likely to find favor among a lot of people. Decent fit and finish, solid input devices and the fabulous JBL sound system left a good impression on us. Thanks to its quad-core i7 processor and the nimble Nvidia graphics card, current gaming titles are no challenge, and noise doesn't flare up at load. 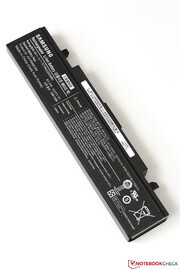 When away from the mains, the battery perseveres for several hours before it drains out. 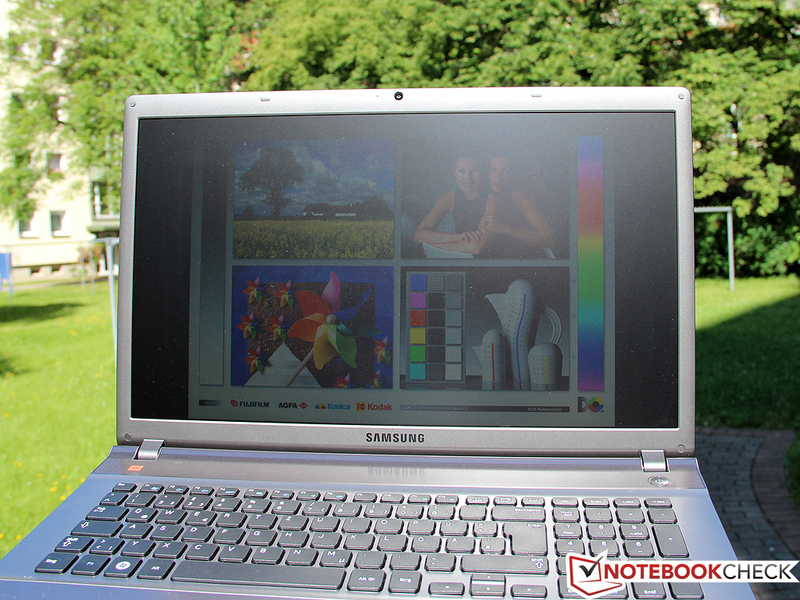 Subsequently, this notebook with its anti-glare screen should be suitable for outdoor use, but is let down by its low power LED backlight. 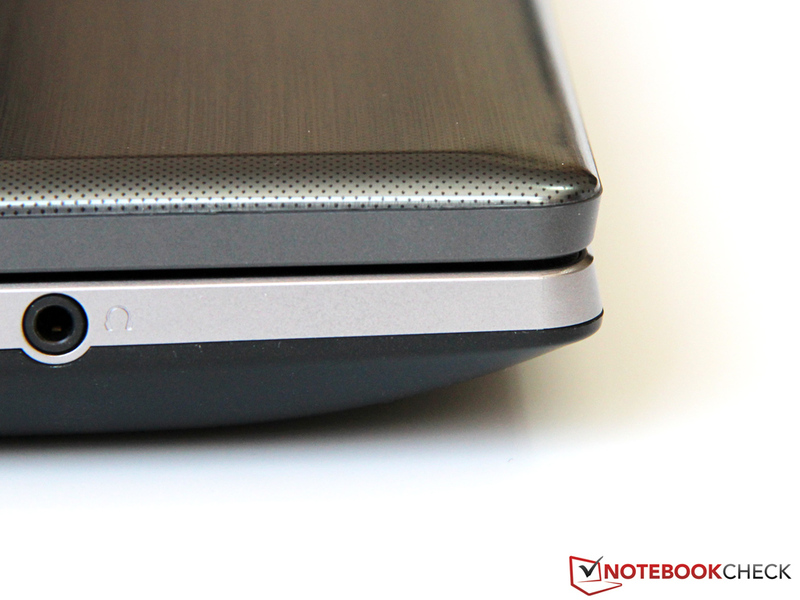 Finally, the low contrast display is the biggest disappointment with this notebook. In particular, a multimedia machine would be significantly better with a fullHD display as the screen in the One M73. We can only appeal to Samsung to include such a display, at least as an option. Then we could give it an unqualified thumbs-up the next time round. The sound system leaves a good impression. It is rather doubtful how long these little plastic hooks will survive. or hard disk drive were easily upgradeable. 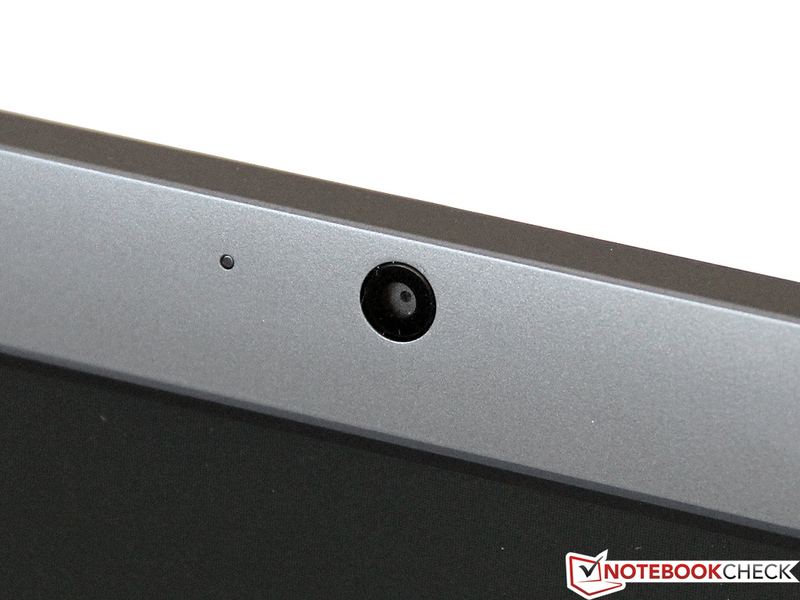 A free slot for a second 2.5-inch drive is available. which lasts for a maximum 7 hours of operation. only when playing racing games the small cursor keys are annoying. Many LEDs indicate the operating status. There's more to Samsung's 550P7C than meets the eye. but case stability suffers a bit due to that. has been decorated with a delicate pattern. Room for improvement: The display wobbles strongly on impact. We couldn't find fault with the build quality. 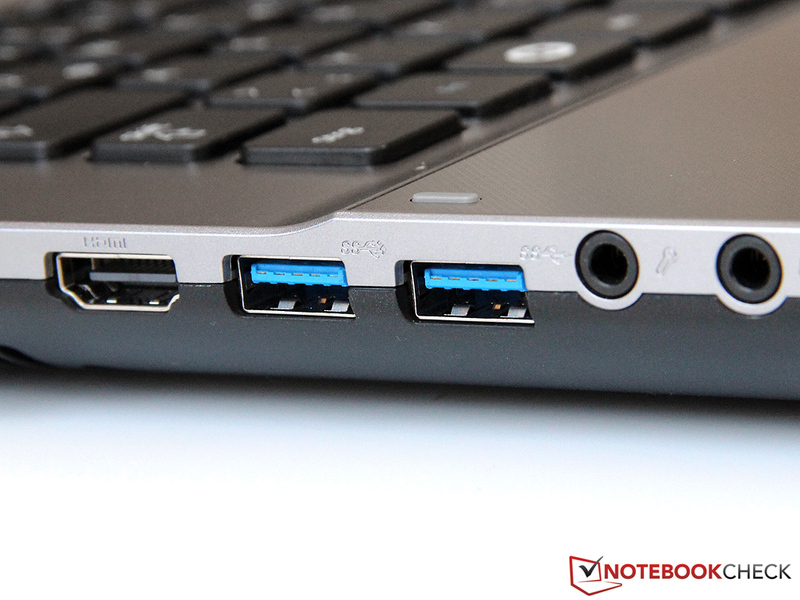 USB 3.0 is present with two ports. Instead of the muffled sound produced by the microphone a headset is a better option. and still the noise levels remain pleasantly low. 90 Watts is too little under full load - resulting in throttling. Smart design, excellent office qualities and its powerful hardware make the Samsung 550P7C a perfect all-rounder, capable of replacing a desktop PC in many cases. Although the display scores by having an anti-glare finish, it disappoints with regard to its contrast and viewing angles. A high-grade full-HD panel would have delighted not only gamers and movie buffs. 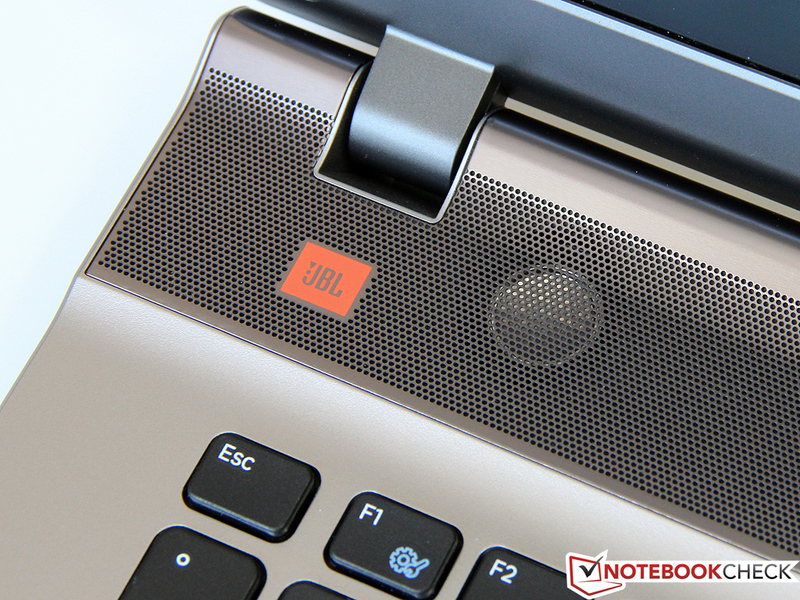 We were baffled by the maximum sound levels produced by JBL's small 2.1 sound system. Even the sound quality is good enough to make externa speakers unnecessary. With similar configurations, the One M73, Acer Aspire V3 or the smaller Schenker XMG A502 could be suitable alternatives. 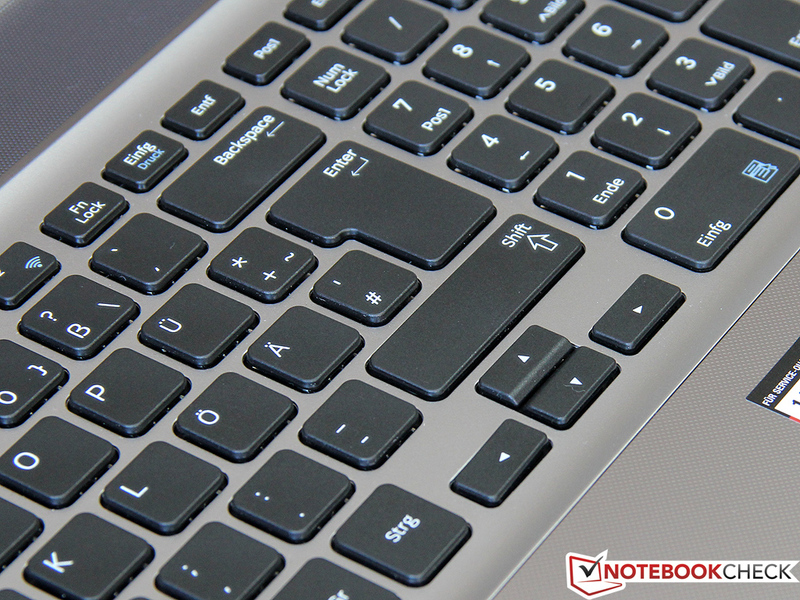 HP's Pavilion dv7 has also been updated with Ivy Bridge processors, but has a less powerful graphics solution.